BHU Entrance Exam Question Paper 2019: As we know very well that Banaras Hindu University or BHU is one of the most reputed Universities in India. It is also known as Central Hindu College or Kashi Hindu. The BHU organize UET and PET entrance exam to provide Admission into most of the offered courses. The Combination of these exams is known as BHU Entrance Exam. To get admission into this world-class university, Candidates need dedication, hard work and preparation stuff. In this article, we are providing BHU Entrance Exam Previous Year Question Papers for all the courses. The Exam Authority provides BHU Entrance Exam Previous Year Question Papers on the Official website. Candidates can use these links to reach directly to the Question Papers Page. After reaching there, They will need to click on the exam and the stram/ course. After it they can download the Question Papers in pdf format. How to Download BHU Entrance Exam Previous Question Papers? To Get more Papers Candidates can follow the steps given below. Currently, there are papers from 2014 to 2018 are available on the official website. But they will update it soon. Click on Admission and then click on UET or PET. On the New Page t right side you will see a box containing links to BHU Old Papers. Click on preferred year paper. 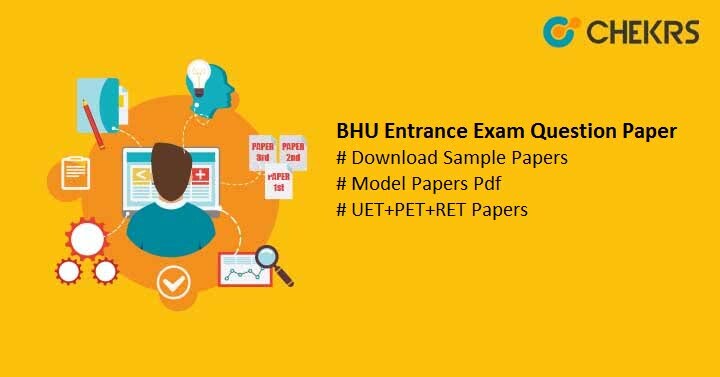 Now Click on any of the relevant program paper like BHU UET/ PET/ RET Old Question Papers (Year). New list will appear with all the papers. Download according to your course/ stream/program. BHU Entrance Exam Previous Year Papers will be very beneficial in your Preparation; you can easily observe Exam Pattern, Scheme, and difficulty level of BHU Entrance Exam. After observing the Papers, Candidates can manage their time for the BHU Entrance Exam Preparation. Students can observe their mistakes and topics in which they are having problems and work on them before appearing in the actual exam. Don’t forget to do the regular revision. Eat well, take proper rest and take care of your health. Prefer Quality books and use graphical methods to remember things better. That’s it guys, We hope this article will help you to boost your performance in the BHU Entrance Exam 2019. We are searching for some sample papers and when we will find them the table will be updated. Good Luck & Keep Visiting.